Customers from a broad array of industries rely on us at A/C Fabricating Corporation for the finest custom tube manufacturing services available. We specialize in fulfilling complex design requirements with the highest quality parts, prompt turnaround times, and competitive prices. 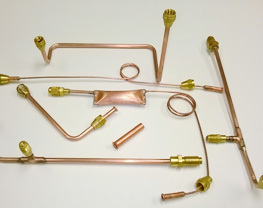 In this example a customer in the automotive and HVAC industry came to us for assistance with the fabrications of a copper Freon evacuation system. They were not able to properly design these lines in-house and required a low cost solution. We enlisted our expert staff of engineers, designers, and machinists to help them fabricate this system. We began by designing all of the copper runs that our customer required. 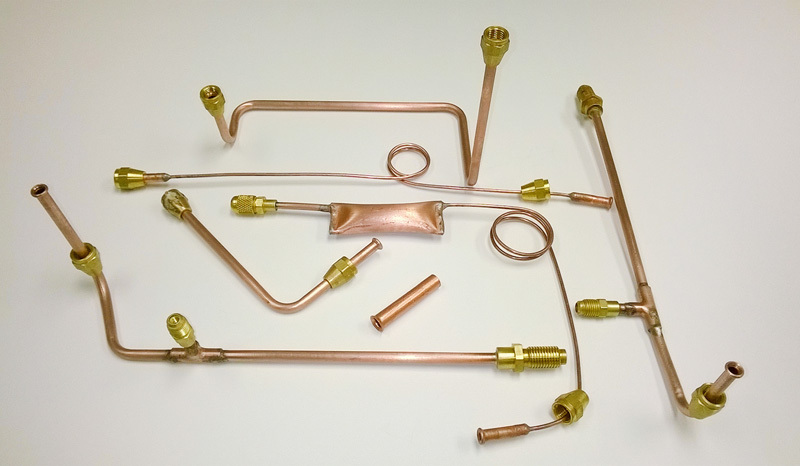 Using state-of-the-art machinery that included pneumatic blenders and an end forming press, our staff fully fabricated and assembled these copper systems. They were created by bending, end forming, and brazing, followed by full assembly. These parts were manufactured with an uncompromising level of accuracy, fabricated in a number of different shapes and sizes and to tightest tolerances of ±0.030”. We ensured the copper parts that made up this system were of the highest quality with thorough in-process testing and inspections. We checked all gages, used precision measuring tools, and held final inspections for all parts in the system. Our customer’s specifications were met, and the piping system was completed in its entirety and delivered to our customer in the Midwest within just two weeks. Our client was pleased with the results; over the full life of production, we manufactured a total of 250,000 of these systems. To find out more about this project or to learn how we can put our precision fabrication services to use for your next project, please contact us directly.